I promise this will be my LAST post on my visit earlier this week to Edward Gorey House (at least for a while...? ), but I thought it essential to share with you my purchases from the gift shop. Of course I was highly excited about the gift shop, and indeed, they had a very fine Gorey selection. Above, we have the poster for this year's exhibit itself, Edward Gorey's Envelope Art. 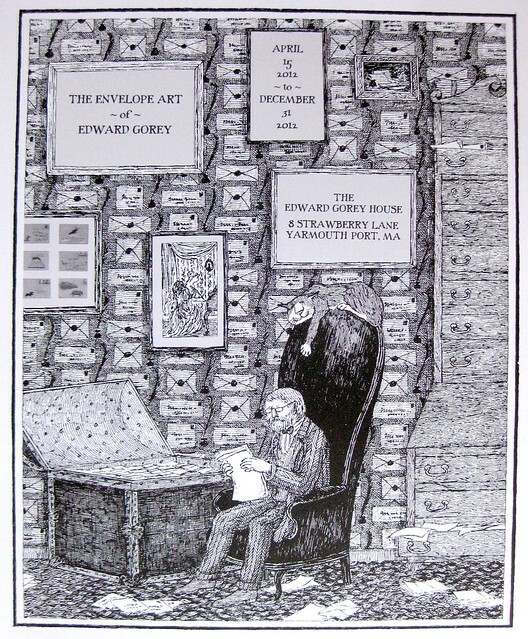 The poster doesn't show Gorey's actual envelope art, but it does show some lovely mail-related Gorey artwork. I wish they had this poster available as postcards, or this artwork as a postcard, but oh well. I was so taken with the poster that I just had to buy it, for decor as well as a fun commemorative. It is adapted from Gorey's cover art for "Other People's Mail," Berg Collection, NY Public Library, 1974. 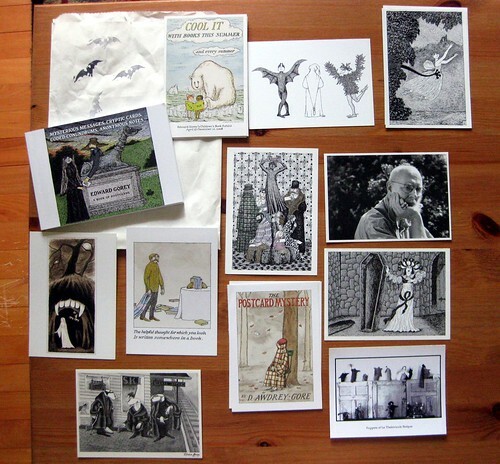 They had a fine selection of Gorey postcards, so of course I had to buy a bunch. Here they all are. I included the paper back they came in, because it was pre-stamped with bat stamps. SWOON! There's the full info from the back of the postcard, for those of you who (like me) want the full story. 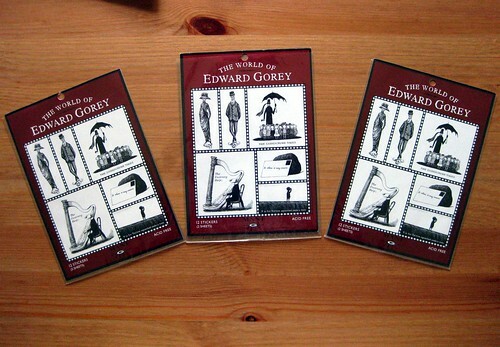 I was terribly excited to see these "The World of Edward Gorey" stickers, because as far as I know, they're discontinued. I used to buy them regularly online and in certain bookstores/stationery stores, but I haven't found them anywhere in years! So I had to buy three sets. Yay. I wanted to chronicle my finds before I sent any, but now I think it's time to go write some Edward Gorey postcards. I have ordered from Gorey Details before. While their stock is fantastic, I have not had the best customer service. After two frustrating orders in a row, I swore off ordering from them for a while. I love the Goreyana blog! It's one of the best Gorey blogs around. 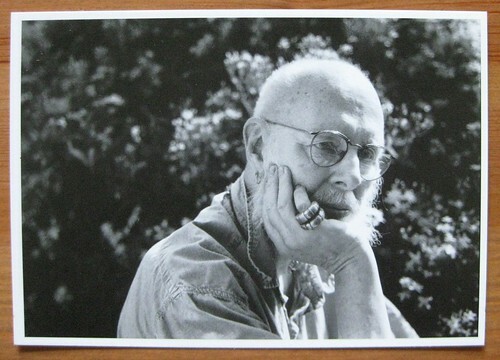 Thanks a lot for sharing the stuff that you bought from the Edward Gorey gift shop! The postcards and stickers are just awesome. I wish I could buy such stuff here in India.It's really great! I've enjoyed all the posts -- and seeing your photo too! Nice to put a face to a name. Sounds like you really enjoyed your visit. I have totally enjoyed your posts on Edward Gorey! I absolutely love his drawings. Believe it or not, the University of Hawaii is touted to be the largest collection of Edward Gorey items. It was donated by someone a number of years ago and once every couple of years, they bring it out on display. It is really something to see! The University of Hawaii?!? Wow! Who knew?